"SSH" redirects here. For other uses, see SSH (disambiguation). SSH provides a secure channel over an unsecured network in a client–server architecture, connecting an SSH client application with an SSH server. The protocol specification distinguishes between two major versions, referred to as SSH-1 and SSH-2. The standard TCP port for SSH is 22. SSH is generally used to access Unix-like operating systems, but it can also be used on Microsoft Windows. Windows 10 uses OpenSSH as its default SSH client. SSH was designed as a replacement for Telnet and for unsecured remote shell protocols such as the Berkeley rlogin, rsh, and rexec protocols. Those protocols send information, notably passwords, in plaintext, rendering them susceptible to interception and disclosure using packet analysis. The encryption used by SSH is intended to provide confidentiality and integrity of data over an unsecured network, such as the Internet, although files leaked by Edward Snowden indicate that the National Security Agency can sometimes decrypt SSH, allowing them to read the contents of SSH sessions. On Unix-like systems, the list of authorized public keys is typically stored in the home directory of the user that is allowed to log in remotely, in the file ~/.ssh/authorized_keys. This file is respected by SSH only if it is not writable by anything apart from the owner and root. When the public key is present on the remote end and the matching private key is present on the local end, typing in the password is no longer required (some software like Message Passing Interface (MPI) stack may need this password-less access to run properly). However, for additional security the private key itself can be locked with a passphrase. The private key can also be looked for in standard places, and its full path can be specified as a command line setting (the option -i for ssh). The ssh-keygen utility produces the public and private keys, always in pairs. SSH also supports password-based authentication that is encrypted by automatically generated keys. In this case, the attacker could imitate the legitimate server side, ask for the password, and obtain it (man-in-the-middle attack). However, this is possible only if the two sides have never authenticated before, as SSH remembers the key that the server side previously used. The SSH client raises a warning before accepting the key of a new, previously unknown server. Password authentication can be disabled. An SSH client program is typically used for establishing connections to an SSH daemon accepting remote connections. Both are commonly present on most modern operating systems, including macOS, most distributions of Linux, OpenBSD, FreeBSD, NetBSD, Solaris and OpenVMS. Notably, versions of Windows prior to 1709 do not include SSH by default. Proprietary, freeware and open source (e.g. PuTTY, and the version of OpenSSH which is part of Cygwin) versions of various levels of complexity and completeness exist. File managers for UNIX-like systems (e.g. Konqueror) can use the FISH protocol to provide a split-pane GUI with drag-and-drop. The open source Windows program WinSCP provides similar file management (synchronization, copy, remote delete) capability using PuTTY as a back-end. Both WinSCP and PuTTY are available packaged to run directly off a USB drive, without requiring installation on the client machine. Setting up an SSH server in Windows typically involves enabling a feature in Settings app. In Windows 10 version 1709, an official Win32 port of OpenSSH is available. In 1995, Tatu Ylönen, a researcher at Helsinki University of Technology, Finland, designed the first version of the protocol (now called SSH-1) prompted by a password-sniffing attack at his university network. The goal of SSH was to replace the earlier rlogin, TELNET, FTP and rsh protocols, which did not provide strong authentication nor guarantee confidentiality. Ylönen released his implementation as freeware in July 1995, and the tool quickly gained in popularity. Towards the end of 1995, the SSH user base had grown to 20,000 users in fifty countries. In December 1995, Ylönen founded SSH Communications Security to market and develop SSH. The original version of the SSH software used various pieces of free software, such as GNU libgmp, but later versions released by SSH Communications Security evolved into increasingly proprietary software. It was estimated that by the year 2000 the number of users had grown to 2 million. "Secsh" was the official Internet Engineering Task Force's (IETF) name for the IETF working group responsible for version 2 of the SSH protocol. In 2006, a revised version of the protocol, SSH-2, was adopted as a standard. This version is incompatible with SSH-1. SSH-2 features both security and feature improvements over SSH-1. Better security, for example, comes through Diffie–Hellman key exchange and strong integrity checking via message authentication codes. New features of SSH-2 include the ability to run any number of shell sessions over a single SSH connection. Due to SSH-2's superiority and popularity over SSH-1, some implementations such as libssh(v0.8.0+), Lsh and Dropbear support only the SSH-2 protocol. In January 2006, well after version 2.1 was established, RFC 4253 specified that an SSH server which supports both 2.0 and prior versions of SSH should identify its protoversion as 1.99. This is not an actual version but a method to identify backward compatibility. In 1999, developers, wanting a free software version to be available, went back to the older 1.2.12 release of the original SSH program, which was the last released under an open source license. Björn Grönvall's OSSH was subsequently developed from this codebase. Shortly thereafter, OpenBSD developers forked Grönvall's code and did extensive work on it, creating OpenSSH, which shipped with the 2.6 release of OpenBSD. From this version, a "portability" branch was formed to port OpenSSH to other operating systems. As of 2005[update], OpenSSH was the single most popular SSH implementation, coming by default in a large number of operating systems. OSSH meanwhile has become obsolete. OpenSSH continues to be maintained and supports the SSH-2 protocol, having expunged SSH-1 support from the codebase with the OpenSSH 7.6 release. Example of tunneling an X11 application over SSH: the user 'josh' has SSHed from the local machine 'foofighter' to the remote machine 'tengwar' to run xeyes. Logging into OpenWrt via SSH using PuTTY running on Windows. SSH is a protocol that can be used for many applications across many platforms including most Unix variants (Linux, the BSDs including Apple's macOS, and Solaris), as well as Microsoft Windows. Some of the applications below may require features that are only available or compatible with specific SSH clients or servers. For example, using the SSH protocol to implement a VPN is possible, but presently only with the OpenSSH server and client implementation. For securing file transfer protocols. rsync, intended to be more efficient than SCP. Generally runs over an SSH connection. Fast and Secure Protocol (FASP), aka Aspera, uses SSH for control and UDP ports for data transfer. 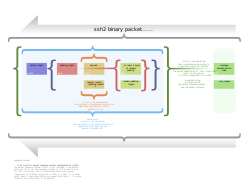 Diagram of the SSH-2 binary packet. The transport layer (RFC 4253), which typically runs on top of TCP/IP. This layer handles initial key exchange as well as server authentication, and sets up encryption, compression and integrity verification. It exposes to the upper layer an interface for sending and receiving plaintext packets with sizes of up to 32,768 bytes each (more can be allowed by the implementation). The transport layer also arranges for key re-exchange, usually after 1 GB of data has been transferred or after 1 hour has passed, whichever occurs first. password: a method for straightforward password authentication, including a facility allowing a password to be changed. Not all programs implement this method. publickey: a method for public key-based authentication, usually supporting at least DSA, ECDSA or RSA keypairs, with other implementations also supporting X.509 certificates. keyboard-interactive (RFC 4256): a versatile method where the server sends one or more prompts to enter information and the client displays them and sends back responses keyed-in by the user. Used to provide one-time password authentication such as S/Key or SecurID. Used by some OpenSSH configurations when PAM is the underlying host-authentication provider to effectively provide password authentication, sometimes leading to inability to log in with a client that supports just the plain password authentication method. GSSAPI authentication methods which provide an extensible scheme to perform SSH authentication using external mechanisms such as Kerberos 5 or NTLM, providing single sign-on capability to SSH sessions. These methods are usually implemented by commercial SSH implementations for use in organizations, though OpenSSH does have a working GSSAPI implementation. The SSHFP DNS record (RFC 4255) provides the public host key fingerprints in order to aid in verifying the authenticity of the host. This open architecture provides considerable flexibility, allowing the use of SSH for a variety of purposes beyond a secure shell. The functionality of the transport layer alone is comparable to Transport Layer Security (TLS); the user-authentication layer is highly extensible with custom authentication methods; and the connection layer provides the ability to multiplex many secondary sessions into a single SSH connection, a feature comparable to BEEP and not available in TLS. SSH-over-SCTP: support for SCTP rather than TCP as the connection oriented transport layer protocol. ECDSA: support for elliptic curve DSA rather than DSA or RSA for signing. ECDH: support for elliptic curve Diffie–Hellman rather than plain Diffie–Hellman for encryption key exchange. UMAC: support for UMAC rather than HMAC for MAC/integrity. In 1998 a vulnerability was described in SSH 1.5 which allowed the unauthorized insertion of content into an encrypted SSH stream due to insufficient data integrity protection from CRC-32 used in this version of the protocol. A fix known as SSH Compensation Attack Detector was introduced into most implementations. Many of these updated implementations contained a new integer overflow vulnerability that allowed attackers to execute arbitrary code with the privileges of the SSH daemon, typically root. In January 2001 a vulnerability was discovered that allows attackers to modify the last block of an IDEA-encrypted session. The same month, another vulnerability was discovered that allowed a malicious server to forward a client authentication to another server. Since SSH-1 has inherent design flaws which make it vulnerable, it is now generally considered obsolete and should be avoided by explicitly disabling fallback to SSH-1. Most modern servers and clients support SSH-2. In November 2008, a theoretical vulnerability was discovered for all versions of SSH which allowed recovery of up to 32 bits of plaintext from a block of ciphertext that was encrypted using what was then the standard default encryption mode, CBC. The most straightforward solution is to use CTR, counter mode, instead of CBC mode, since this renders SSH resistant to the attack. On December 28, 2014 Der Spiegel published classified information leaked by whistleblower Edward Snowden which suggests that the National Security Agency may be able to decrypt some SSH traffic. The technical details associated with such a process were not disclosed. An analysis in 2017 of the hacking tools BothanSpy & Gyrfalcon suggested that the SSH protocol itself was not compromised. The following RFC publications by the IETF "secsh" working group document SSH-2 as a proposed Internet standard. It was later modified and expanded by the following publications. ^ "SSH Hardens the Secure Shell". Serverwatch.com. Archived from the original on 2008-12-23. ^ a b "Prying Eyes: Inside the NSA's War on Internet Security". Spiegel Online. December 28, 2014. Archived from the original on January 24, 2015. ^ "How To Set Up Authorized Keys". Archived from the original on 2011-05-10. ^ "Service Name and Transport Protocol Port Number Registry". iana.org. Archived from the original on 2001-06-04. ^ "Download PuTTY - a free SSH and telnet client for Windows". Putty.org. Archived from the original on 2014-05-27. Retrieved 2014-04-28. ^ "Cygwin Package List". Retrieved January 5, 2016. ^ "WinSCP home page". Archived from the original on 2014-02-17. ^ "WinSCP page for PortableApps.com". Archived from the original on 2014-02-16. ^ "PuTTY page for PortableApps.com". Archived from the original on 2014-02-16. ^ Amies, A; Wu, C F; Wang, G C; Criveti, M (2012). "Networking on the cloud". IBM developerWorks. Archived from the original on 2013-06-14. ^ Tatu Ylönen. "The new skeleton key: changing the locks in your network environment". Archived from the original on 2017-08-20. ^ Tatu Ylönen. "SSH Port". Archived from the original on 2017-08-03. ^ Nicholas Rosasco and David Larochelle. "How and Why More Secure Technologies Succeed in Legacy Markets: Lessons from the Success of SSH" (PDF). Quoting Barrett and Silverman, SSH, the Secure Shell: The Definitive Guide, O'Reilly & Associates (2001). Dept. of Computer Science, Univ. of Virginia. Archived (PDF) from the original on 2006-06-25. Retrieved 2006-05-19. ^ "Secsh Protocol Documents". VanDyke Software, Inc. Archived from the original on 2010-01-13. ^ "SSH Frequently Asked Questions". Archived from the original on 2004-10-10. ^ "A GNU implementation of the Secure Shell protocols". Archived from the original on 2012-02-04. ^ "Dropbear SSH". Archived from the original on 2011-10-14. ^ "OpenSSH: Project History and Credits". openssh.com. 2004-12-22. Archived from the original on 2013-12-24. Retrieved 2014-04-27. ^ "OSSH Information for VU#419241". Archived from the original on 2007-09-27. ^ Sobell, Mark (2012). A Practical Guide to Linux Commands, Editors, and Shell Programming (3rd Edition). Upper Saddle River, NJ: Prentice Hall. pp. 702–704. ISBN 978-0133085044. ^ Seggelmann, R.; Tuxen, M.; Rathgeb, E.P. (18–20 July 2012). "SSH over SCTP — Optimizing a multi-channel protocol by adapting it to SCTP". Communication Systems, Networks & Digital Signal Processing (CSNDSP), 2012 8th International Symposium on: 1–6. doi:10.1109/CSNDSP.2012.6292659. ISBN 978-1-4577-1473-3. ^ a b Stebila, D.; Green J. (December 2009). "RFC5656 - Elliptic Curve Algorithm Integration in the Secure Shell Transport Layer". Archived from the original on 19 July 2012. Retrieved 12 November 2012. ^ Miller, D.; Valchev, P. (September 3, 2007). "The use of UMAC in the SSH Transport Layer Protocol / draft-miller-secsh-umac-00.txt". Archived from the original on 19 August 2014. Retrieved 12 November 2012. ^ "SSH Insertion Attack". Core Security Technologies. Archived from the original on 2011-07-08. ^ "Vulnerability Note VU#13877 - Weak CRC allows packet injection into SSH sessions encrypted with block ciphers". US CERT. Archived from the original on 2010-07-10. ^ "SSH CRC-32 Compensation Attack Detector Vulnerability". SecurityFocus. Archived from the original on 2008-07-25. ^ "Vulnerability Note VU#945216 - SSH CRC32 attack detection code contains remote integer overflow". US CERT. Archived from the original on 2005-10-13. ^ "Vulnerability Note VU#315308 - Weak CRC allows last block of IDEA-encrypted SSH packet to be changed without notice". US CERT. Archived from the original on 2010-07-11. ^ "Vulnerability Note VU#684820 - SSH-1 allows client authentication to be forwarded by a malicious server to another server". US CERT. Archived from the original on 2009-09-01. ^ a b "Vulnerability Note VU#958563 - SSH CBC vulnerability". US CERT. Archived from the original on 2011-06-22. ^ Tatu Ylonen. "BothanSpy & Gyrfalcon - Analysis of CIA hacking tools for SSH", ssh.com, 3 August 2017. Retrieved 15 july 2018. Wikimedia Commons has media related to SSH. This page was last edited on 31 March 2019, at 02:38 (UTC).